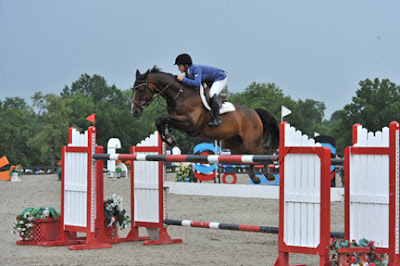 CULPEPER, VA (August 22, 2011) --- Laura Linback of Mundelin, Illinois and Woodrun's Whittaker MVNZ, whom they call "Fred" in the barn, had an amazing week at HITS Culpeper. Last Friday, they captured the win in the $15,000 Brook Ledge Open Jumper Prix and successfully followed up with a big win in the $40,000 HITS Grand Prix, presented by Pfizer Animal Health. Jerry Dougherty of Bokeelia, Florida was the Grand Prix course designer for the Winston National and Sunday's premier card featured 26 starters. "The course was spectacular," said Linback, who is a regular competitor at HITS Culpeper and HITS Ocala and travels alongside her husband, Troy and their son, Owen. "It rode really well and I was pretty confident about it. Fred only rubbed one rail at what seemed to be a difficult line for some." Linback was rightfully excited after scoring the two biggest wins in the Grand Prix field this week. "Fred is so easy and fun to ride. It's been a really exciting summer with him," she said. "He's just an eight year-old, so he's still a baby, but he's been going clear a lot this summer in the Grand Prix. He's still young, so we won't over-use him too much, but it's exciting to see where we'll progress." After the first round, five horse-and-rider combinations returned for the jump-off. Australian native Matt Williams of Wellington, Florida aboard Samantha Tuerk's Watch Me VD Mangelaar returned first and set the pace with four jumping faults in 45.508 seconds. The duo has earned major ribbons this summer at HITS Culpeper and HITS-on-the-Hudson in Saugerties, New York as they continue on the home stretch of the HITS show jumping season. Fellow Australian and Nations Cup rider Thaisa Erwin of Apex, North Carolina was the second to go clear in the first round and returned for the jump-off aboard her own Matilda. The duo left all the fences intact, but earned three time faults in the jump-off, which gave them a brief lead and eventually earned them a second-place finish. Overall, it was a successful day for the Apex Equestrian Center, as Thaisa's husband, head trainer Matthias Hollberg finished twelfth aboard his upcoming Pfizer $1 Million Grand Prix mount Wadisson, owned by the Apex Equestrian Center. Linback returned next and took over the lead with a clear effort in 44.780 seconds, which set the Great American Time to Beat. "In the jump-off, I just took a shot," said Linback. "I wanted to ride my horse the best I could and not try to think about it too much. Luckily, it worked out well for us." Linback would also finish in seventh place aboard her second mount, Woodrun's Uppsala. 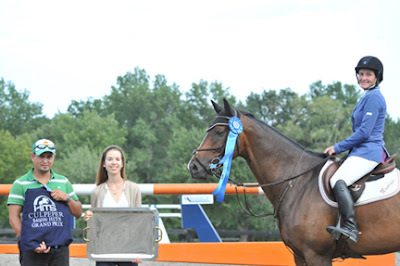 Colombian Olympian Manuel Torres of Ashburn, Virginia and Chambacunero, a 14 year-old gelding owned by TG Show Stables, were the next to show and had the fastest time of 41.584 seconds. Four jumping faults, however, would eventually settle them into third place. Last to show was Kate Gerhart of Sellersville, Pennsylvania aboard Cathy Gerhart's Timo. At the Cavalier Classic in July, they took the second-place ribbon in the $40,000 Purina Mills Grand Prix, presented by Pfizer Animal Health. This time, they had four faults in 43.432 seconds to capture fourth place honors, as they continue on towards the Pfizer Million. "Timo is such a good boy and he's so much fun to ride," said Gerhart. "We're going to try our best to qualify for the Pfizer Million. We still need a few more classes to qualify, but I look forward to being there in Saugerties next month." 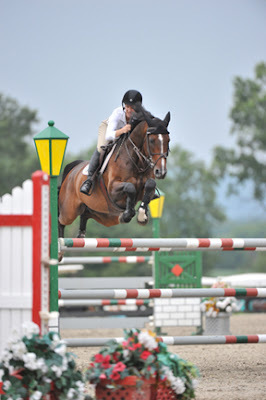 This week, the Constitution Classic will highlight August competition at HITS Commonwealth Park in Culpeper, Virginia. Riders will have one more qualifying class for the Diamond Mills $500,000 Hunter Prix Final and Pfizer Million, when the $5,000 Devoucoux Hunter Prix and $40,000 HITS Grand Prix, presented by Pfizer Animal Health, take center stage this weekend. After this week, the road to Pfizer Million Weekend will move to its final destination at HITS-on-the-Hudson for two consecutive weeks of show jumping and, of course, the richest show jumping finale in the world on Sunday, September 11.